We all know that not getting enough sleep is bad news. But what if you just can’t sleep? Trust me—we’ve all been there. A reported 50 to 70 million Americans struggle with chronic sleep disorders. And according to the CDC, roughly that same number of Americans—at least 50 million—report an insufficient amount of sleep. Unfortunately, rather than get their body’s natural rhythms back in order, many of these people choose to press the proverbial “override button” by taking a prescription sleep aid, which can knock them out regardless of where they are in their circadian cycles. To judge by the sales of the number-one prescription sleeping pill in the country, Ambien, lots and lots of people are going this route. The numbers are truly shocking. The company that makes Ambien reported 12 billion of these pills have been swallowed between 1988 and 2006. In 2012, Ambien was the twelfth most prescribed medication in the country, and the second most prescribed psychiatric medication, with over 44 million prescriptions filled. But pressing the override button is not the answer. There are just too many risks involved for you to take these medications without first at least investigating other options. If you’re determined to remake your relationship with sleep, start by committing to some lifestyle adjustments to get your days (and nights!) back in order with your natural rhythms. It might take more effort than popping another pill, but the results will last far longer, and will leave you feeling better than you have in years. If you suffer from insomnia, I really encourage you to try a drug-free option first, starting with cognitive behavioral therapy, which has been shown to help people fall asleep faster than prescription sleeping pills do. Small changes in diet can be extremely effective as well, since most Americans aren’t getting enough omega-3s, which are essential for supporting melatonin production. The omega-3 DHA found in seafood has been shown to improve sleep duration and quality. In the 7-Day Mood Revolution found in my book, you’ll be eating one DHA-rich omega-3 superfood per day, which may help you sleep better naturally. One study showed that melatonin can reduce the amount of time it takes to fall asleep; in some cases, the supplements actually outperformed some prescription sleep aids. Melatonin can also promote both sleep quality and morning alertness, which can be especially helpful for two groups of people who have been shown to experience significant dangers when taking Ambien: women and the elderly. And unlike prescription sleep aids, melatonin comes with no withdrawal effects. That said, while melatonin can correct your body’s circadian rhythms, too much can throw them off. Our bodies produce only about 0.3 mg per day, so start with the lowest dose you need to help improve sleep. And, as always, inform your doctor of any medications or supplements before you take them. Expose your eyes to light first thing in the morning by opening your blinds and turning on your lights as soon as you wake up. Take a walk outside in the morning and over your lunch hour—you’ll get exercise and healing light at the same time. If you have a window in your office, position your desk so that you face it, or are at least perpendicular to the window. If you’re stuck in a windowless office all morning, invest in the LED light bulbs created by Definity Digital. Their “Awake and Alert” light bulb produces blue light to keep you awake, and it’s bright enough to help affect sleep-wake cycles. You can also use a special bulb like Definity Digital’s “Good Night” light bulb, which filters out the blue light in the afternoon and evening, when it’s best to avoid fluorescent and LED lighting. Both bulbs, however, emit light that looks like a regular light bulb. While they’re more expensive than traditional light bulbs, Definity’s lights are very energy efficient, using only about 10 watts to replace 60-watt bulbs. Another bonus: they last much longer than either incandescent or fluorescent bulbs. In rooms with fluorescent lighting like the kitchen, consider installing a light-detecting night-light so you don’t need to turn on the lights in the evening. Install dimmers on your lights. At night, use incandescent lights on a dim setting. If you benefit from naps to stay alert and strong, by all means take them. Research shows that naps can improve performance even if the quality of sleep during naps isn’t great. One study showed that just 18 minutes of sleep provided improvements in reaction time for air traffic controllers. You may need to set aside about 40 minutes, however, as it may take about 20 minutes to actually fall asleep. Since your sleep-wake cycle tends to dip after lunch, the best time for a short nap is probably in the midafternoon. Keep it short to prevent it from interfering with your nighttime rhythms. Scheduling your naps in advance is another good strategy, as it allows your brain to prepare for this ritual, and you may find it easier to fall asleep for a restorative rest. You can and should even nap on the road if necessary: if you find yourself sleepy on a long drive, pull over for about a half hour in a safe place and rest. If you’re having trouble sleeping, you should make every effort to avoid electronics, especially TVs and cell phones, in the evenings. It’s a good idea to turn off all devices three hours before bedtime. (Just imagine what this abstinence will do for your connections with your loved ones!) If you must remain plugged in, turn your phone, tablet, or laptop to the dimmest setting possible, or—even better—use them while wearing sunglasses with orange-tinted lenses, which can block the blue light that can alter your circadian rhythms. Remove TVs and other electronic devices from your bedroom. Instead of charging your phone in your bedroom, place it in the living room or kitchen to avoid nighttime checking. If you read before bed, ditch your electronic reader and instead read old-fashioned bound books with dim lighting. High-quality sleep isn’t just affected by the brightness or color of light but by body temperature. Because body temperature fluctuates during the day and night, room temperature should also vary. Your body temperature is higher in the afternoon and evening, then starts to dip when it’s time for bed, and reaches its lowest in the morning hours when some of the most restorative sleep is taking place. Keeping your room cool can help facilitate this natural cooling process that occurs during sleep. While 70 degrees is a good room temperature while you’re awake, a good sleeping room temperature should be even lower, somewhere around 66 to 68 degrees. Another idea is to take a hot shower or bath before bed, which can help induce sleep for two reasons: the warm water will relax your muscles and when you get out of the shower or bath, your body temperature will dip. For the best sleep, keep your body as cool as possible, with the exception of your feet. Make sure they’re warm, wearing socks if you need to, as having cold feet may prevent you from falling asleep. 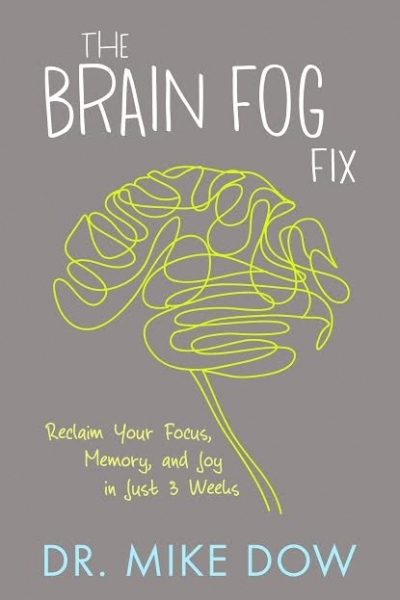 My book The Brain Fog Fix dives into the simple lifestyle changes that will vastly improve your quality of life. Rebalancing crucial hormones in your body will keep you energized, calm, focused, optimistic, and inspired.